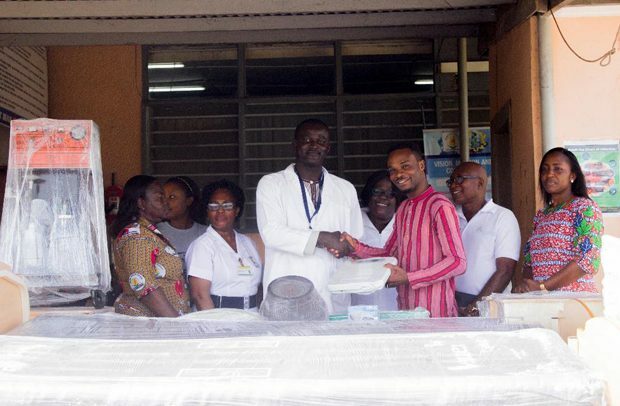 Gospel artiste Francis Kofi Blewusi Dedzi, known in the gospel music scene as Pastor Kofy, has donated some equipment and hospital materials to the La General Hospital maternity in Accra. The items donated include beds, bedside cabinet, adult and baby weighing machines, suction machine, blood pressure (BP) monitor, Bristol maid trolley, among others, worth over GH¢ 42, 000. Presenting the items to the management of the hospital, Pastor Kofy disclosed that the donation was to help bring comfort to the patients at the hospital. According to Pastor Kofy, the donation forms part of his social responsibilities towards giving back to the society and the country as a whole. He, however, assured the management of the hospital of more of such donations in the future. Pastor Kofy urged those who have been blessed with wealth to extend a helping hand to the less-privileged in the society. Dr. Ebenezer Oduro Mensah, medical superintendent of La General Hospital who received the items on behalf of the hospital, thanked Pastor Kofy for his kind gesture. He also urged other well endowed individuals and organisations to assist the hospital. Pastor Kofy has a number of hit songs such as ‘Yehowa’, featuring award-winning South African gospel artiste, Ayanda Ntanzi, and a host of others to his credit. He released his first album in 2015 titled ‘Mensa Aka’, which has eight soul-touching songs.